Fraudsters have found ways to steal money from victims through a whole host of ways that include online as well as offline, and use a variety of different ways to communicate to potential victims. 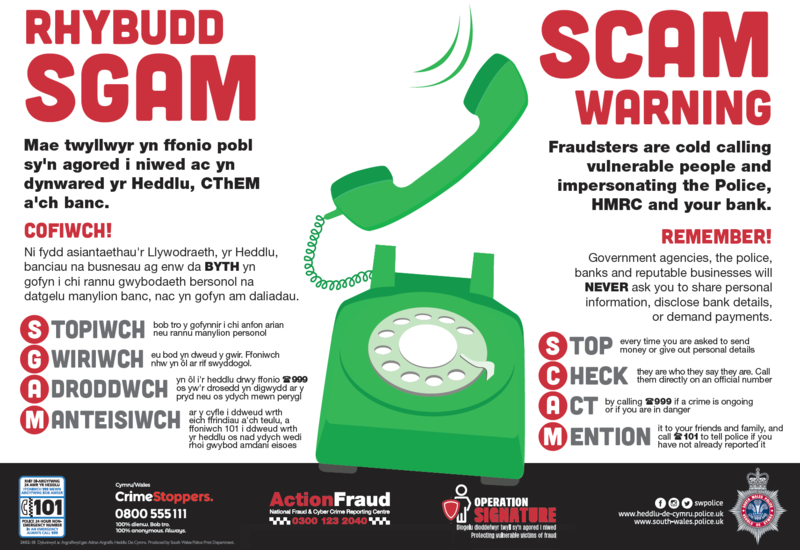 You can find out more information about fraud on the Action Fraud website. Fraudsters use increasingly sophisticated means to take advantage of their victims. They target those they perceive to be vulnerable – including those who are elderly and those who live on their own. You shouldn’t feel embarrassed if you have been scammed. Fraudsters are incredibly clever and innovative, and often rely on other people’s natural goodwill and trust to commit their crimes. There is no shame in being deceived, but if it happens to you please report it so that you can get help and so others don’t fall victim to the same scam in future. If you think you have been a victim of fraud, even if it was unsuccessful, please report it. If you do not, the fraudster will learn from the experience and may be successful next time. Action Fraud is the UK’s national fraud and internet crime reporting centre. They can provide information about fraud and financially-motivated internet crime. If you have been scammed, ripped-off or conned, you can report it to Action Fraud. Report online to Action Fraud or call on 0300 123 2040. Citizens Advice can help you solve your legal, money and other problems by providing free, independent and confidential advice. For more information visit their website or call the helpline on 03454 04 05 06. There is a growing scam in which criminals pose as police officers and ask their victims to take part in a fake undercover operation. Fraudsters are contacting members of the public, usually by phone, purporting to be from the police, or in some cases the fraud team within their bank. The criminal claims they are investigating a fraud at a local bank branch where staff are suspected of being complicit, including issuing fake bank notes, and asks their target to help in the operation. As part of the scam, the individual is requested to visit the branch and withdraw a substantial sum, often thousands of pounds, of the supposedly counterfeit cash to hand over to the ‘police’ for ‘analysis’. The victim is assured that the money will be deposited back into their account after the operation is complete. However, once the money is passed over the fraudster disappears with the cash. The criminal instructs their victim not to discuss the case with anyone in the branch, giving them plausible explanations as to why they are withdrawing the money. As a result, despite being questioned by the bank staff, the victim takes out the cash, convinced that the staff are part of a fraud. In another version of the scam, the criminal convinces the victim to transfer money to a so-called ‘safe account’ to protect their funds from the ‘corrupt’ bank staff. However, the account is in fact controlled by the criminal. Police and banks will never ask members of the public to become part of an anti-fraud operation or to transfer money to a ‘safe account’ for fraud reasons. Victims are being contacted in a variety of methods by fraudsters claiming to be from HMRC and are told they owe an outstanding debt. Fraudsters often ask for payment in iTunes gift cards or voucher codes because they can be easily redeemed and easily sold on. The scammers don’t need the physical card to redeem the value and instead get victims to read out the serial code on the back over the phone. One victim reported purchasing over 15 iTunes gift card vouchers from Argos at £100 pounds each and handing them over to fraudsters on the phone after receiving an automated voice message. Another victim handed gift card voucher codes worth £15,000 after receiving a cold call. Cold called about your pension – just hang up! Mass marketing fraud is when you receive an uninvited contact by email, letter, phone or adverts, making false promises to con you out of money. Mass marketing fraudsters try to lure victims with false promises of large cash prizes, goods or services in exchange for upfront fees, or what they call taxes or donations. It’s also known as share sale fraud, hedge fund fraud, land banking fraud or bond fraud. The majority of investment frauds are run out of offices known as boiler rooms. It is when you are called by a professional-sounding broker who offers you investment opportunities that offer incredible potential for making profit. They usually offer to sell you shares or bonds, but may also offer other investments such as precious metals such as gold, silver or diamond, or wine, art or energy. In reality, the fraudsters are cold calling as many people as possible to pay for bogus investments. Once the fraudsters have made you invest as much money as possible, they quickly disappear just before you’d expect to get the extra money you made from your investment. Phone fraud involves a variety of scams that either persuade you to buy phone-related products/services that turn out to be substandard or non-existent; or to make phone calls or texts to premium services by accident; or to unknowingly sign up to expensive subscription services. These can include missed calls scams, recorded message scams, text message scams, ring tone scams and phone insurance scams. When you’re called by someone pretending to be from your bank or building society and convinced to tell them your card details over the phone. They arrange for a courier to pick up your card to take it away for evidence or to have it destroyed.